The National Maritime Museum’s latest exhibition Samuel Pepys: Plague, Fire, Revolution is the largest-ever exhibition about Samuel Pepys and has over 200 objects on display (some of which come from private collections!). Early last month, I attended a private viewing of this exhibition, and I finally have time to write my thoughts about it. With such a packed title, you would expect it to be quite an experience, and it certainly was. 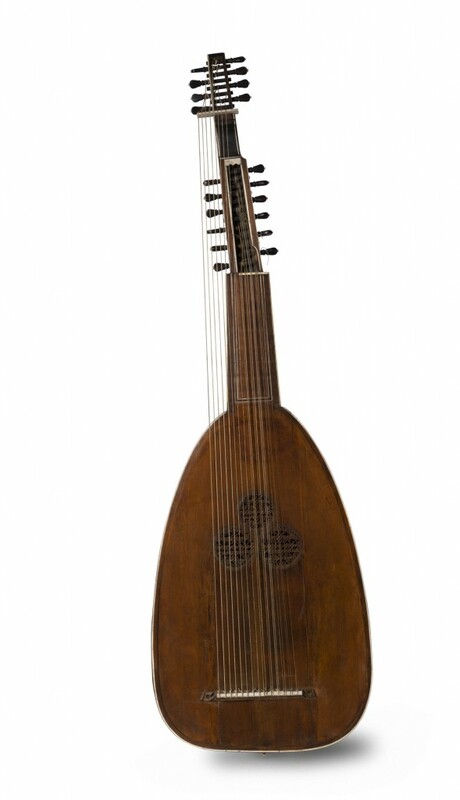 Even though this post has some photos (by kind permission of the National Maritime Museum) – no photo can do justice to the actual items, and if at all possible, I would recommend a visit in person. Sam Pepys (1633 – 1703), the hero of this exhibition was a remarkable fellow. 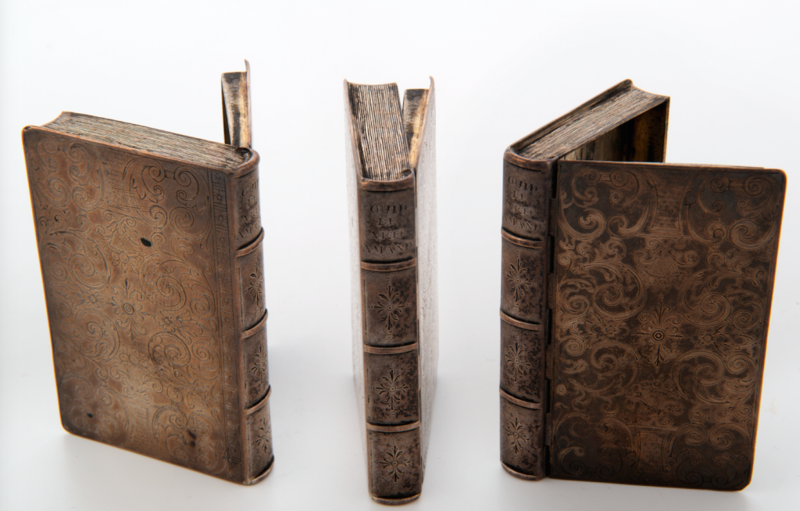 Through his amazing Diary, we’ve been allowed the pleasure of seeing the world of Stuart Britain through his eyes. 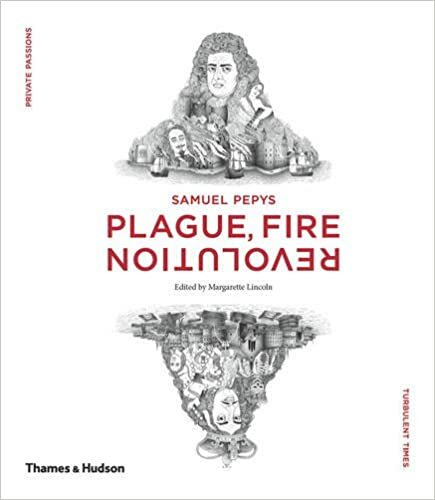 Plague, Fire, Revolution takes us on a chronological journey from the bloody English Civil Wars (including King Charles I’s execution), passed the Interregnum or Commonwealth period, through the Restoration (with nature’s horrors of plague and fire) and ending with the reign of William and Mary. 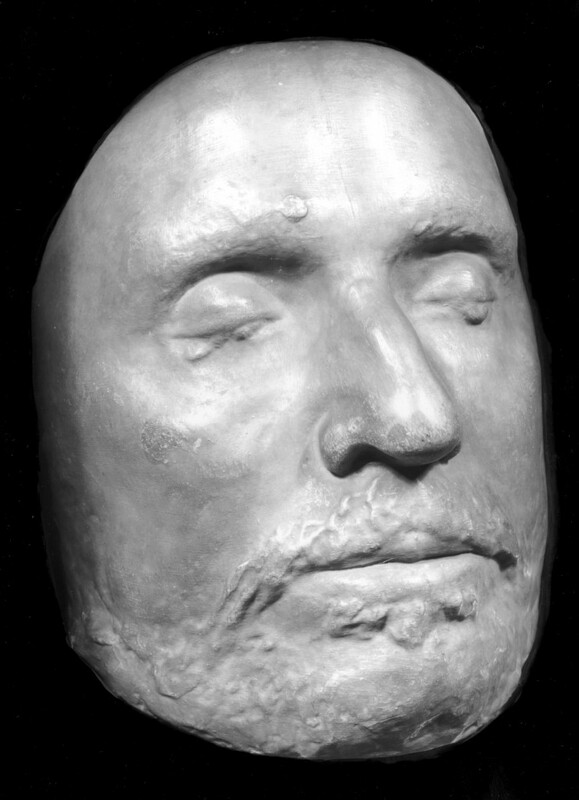 Copy of Oliver Cromwell’s Death Mask, 17 Century, © National Portrait Gallery, London. Pepys was in the crowds which had gathered to witness Charles I’s execution on that cold morning of January 30th, 1649. His diary entry shows he approved of this. 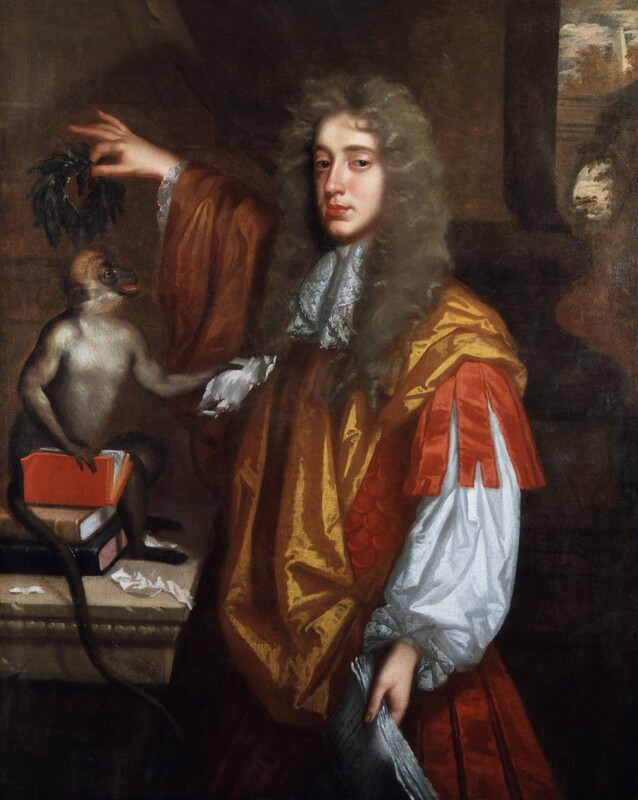 His cousin, Edward Montagu (who later became the 1st Earl of Sandwich), sensing the imminent fall of the Republic, transferred his loyalties to the exiled Charles II, a move from which Pepys himself benefited. Pepys became Montagu’s secretary and then became a clerk in the navy office, putting him in close contact with the likes of James, Duke of York, among others. Although the majority of the exhibition deals with warfare, naval affairs, plague, and fire, it’s not only about those aspects of life in the seventeenth century. 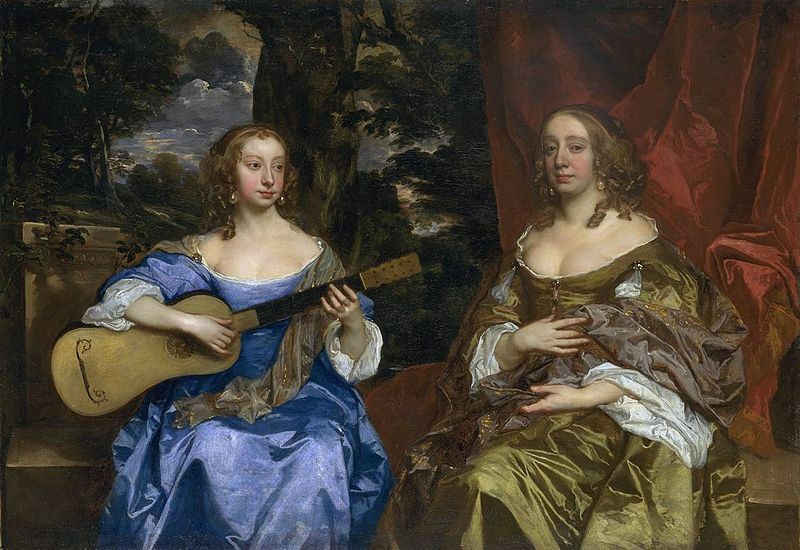 There is a jolly portion devoted to Charles II’s mistresses and the merrier side of life of which Pepys eagerly partook: theatre, music, poetry, women. I found myself drawn back to the outfits that were on display. They were so well-preserved, such works of art in themselves, that I would pay good money just to see them. Portrait of Nell Gwyn, after Sir Peter Lely, c.1678,© Army and Navy Club, London. 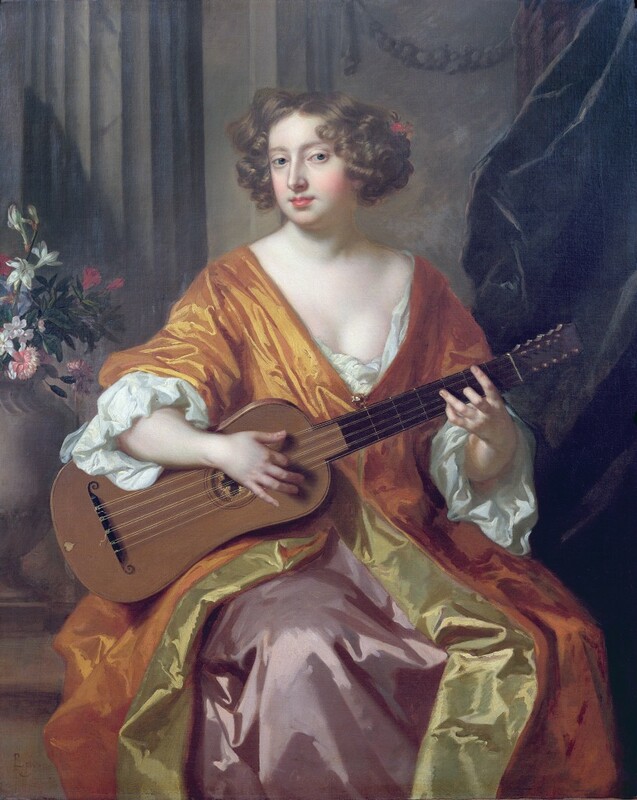 WES66750 Portrait of Mrs Moll Davies, mistress of Charles II, flowers painted by Jean Baptiste Monnoyer (1636-69) by Lely, Sir Peter (1618-80); 124.5×99 cm; © The Trustees of the Weston Park Foundation, UK; (add.info. : mother by Charles II of Lady Mary Tudor whose son was the Earl of Derwentwater;). 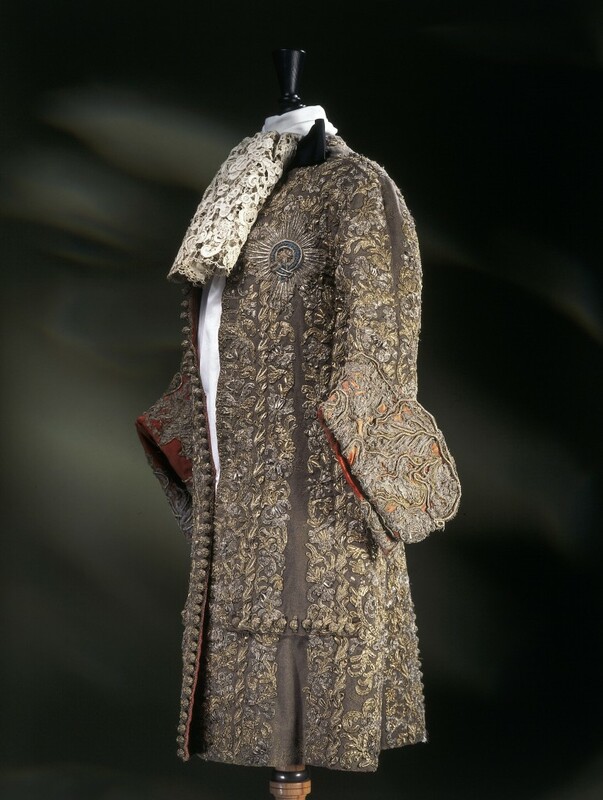 Suit worn by James, Duke of York, at his wedding to Mary of Modena, 1673, ©Victoria and Albert Museum, London. This stunning outfit was worn by James II when Duke of York at his wedding to Mary of Modena. What is completely impossible to tell from this image is how small it actually is in real life. I had seen it before at the Victoria and Albert Museum, but this fact didn’t register with me until historian JD Davies mentioned it to me at a Christmas party. There were two other full outfits, one for a man, the other for a woman, and these were exquisite (alas! I was unable to take a photo of this due to copyright reasons) and the stitching was so precise. For those interested in Late Stuart era fashion history, these clothing displays may be invaluable because you get to look at these items from every angle due to the glass cases in which they have been placed. 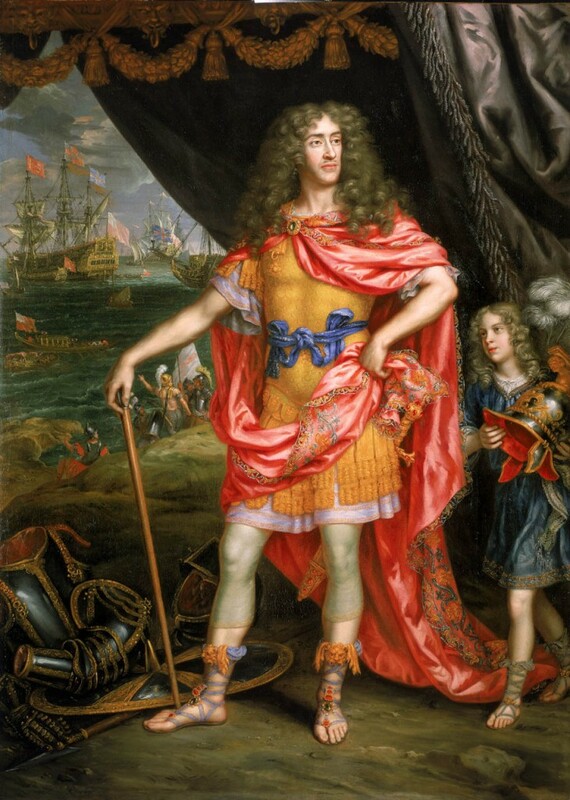 James, Duke of York, 1633-1701, Henri Gascar, 1672-73, © National Maritime Museum, London, Greenwich Hospital Collection. There were many paintings, some I had seen before in other exhibitions (including the Gascar portrait of James II, when Duke of York, a personal favourite of mine), but there were several I had not. One of these (albeit a study) was “James II receiving the Mathematical Scholars of Christ’s Hospital”, from the studio of Antonio Verrio (c. 1639-1707). 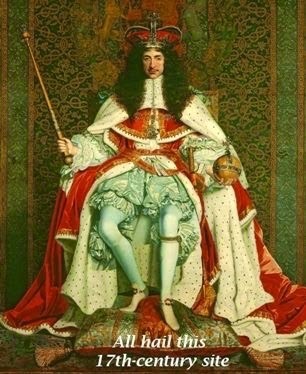 Although I cannot reproduce an image of this here, it is a very wide artwork in which James II takes a central position, sitting upon his throne on a dais, with one long gathering of people to his left and to his right. Pepys is the eighth figure to the right of the king, and he points to a map that is being held aloft by two other gentlemen. Some of the other faces seemed familiar, but I have yet to learn who these people really are. 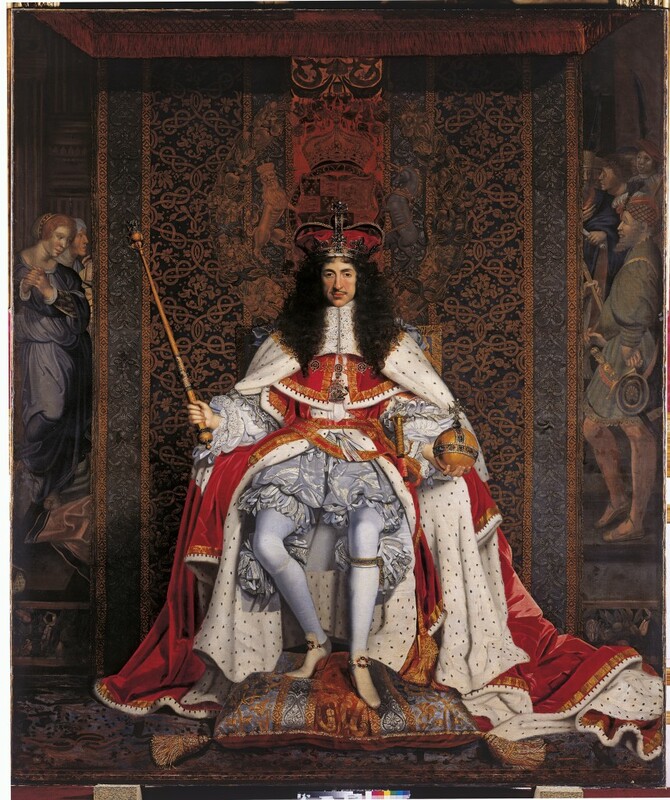 According to the exhibition catalogue (which is superb, by the way), the painting was supposed to depict Charles II, but he died before it could be finished, and so his brother and heir became the replacement. You can learn more about the school here. 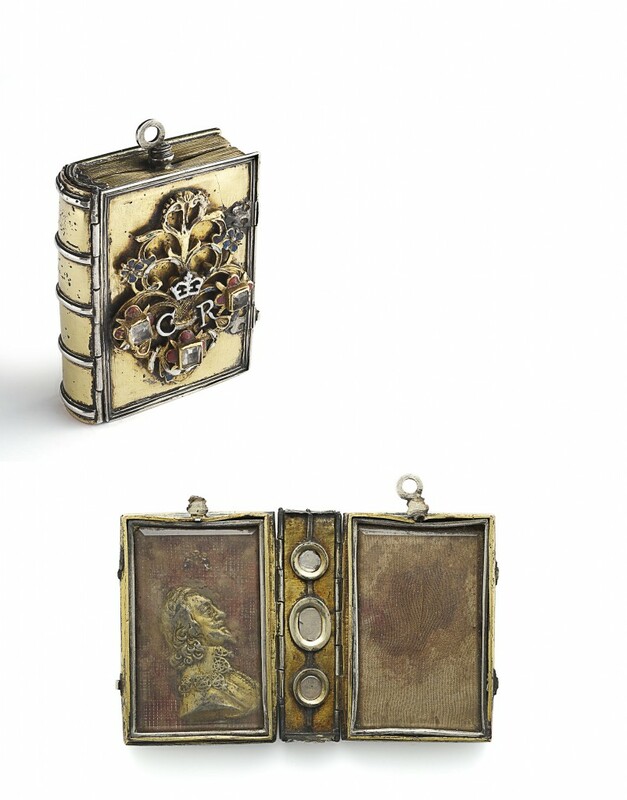 Snuff box in the form of Ovid’s ‘Art of Love’ given to Nell Gwyn by Charles II, c. 1678 © Reproduced by kind permission of the Royal Cornwall Museum. 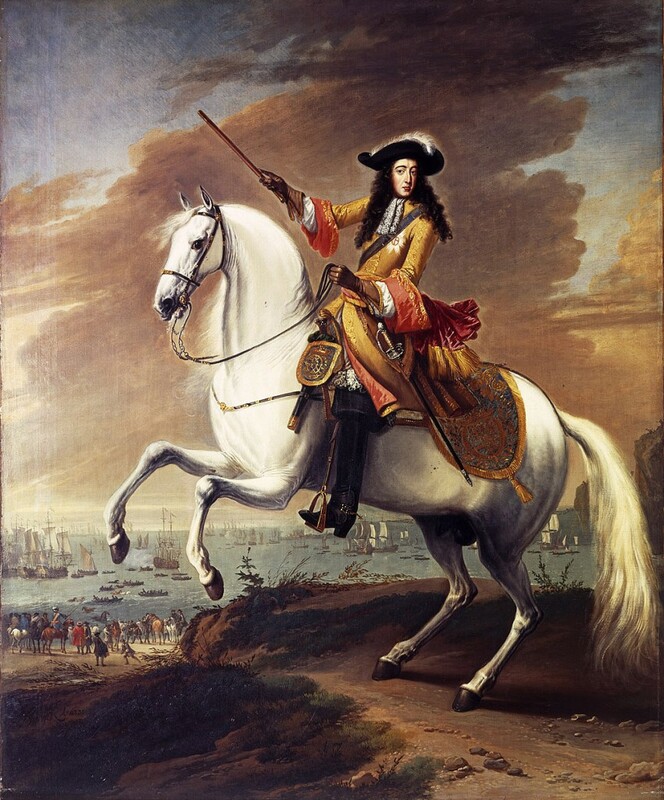 Pepys did pretty well for himself during the reigns of King Charles II and then King James II, but his fortunes changed considerably with the Glorious Revolution of 1688/89. 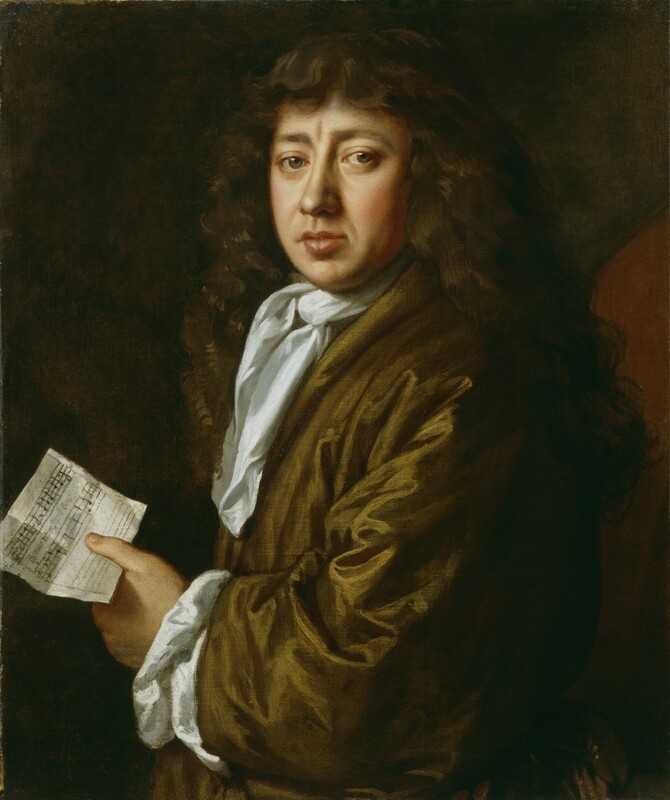 Having already acquired a good amount of wealth in his time as a naval administrator, Pepys decided it was time to resign – thereby sparing himself having to pledge allegiance to yet another regime. William III landing at Brixham, Torbay, 5 November 1688. Jan Wyck. BHC3095 © National Maritime Museum. The gift shop at the end was rather average in my opinion, and although I bought quite a few things there, I honestly expected more books about the 17th-century and, cheekily, perhaps my own recent release. This is perhaps the only area in which I felt there could have been more done, as the shop floor seemed cold and clinical compared to the contents of the exhibition. I think the curators of this exhibition did a fine job of bringing the world of Samuel Pepys to life. The exhibition is technically good as well, for the lighting and sound effects throughout add just the right touch. In short, if you can go to this exhibition, do! I would also advise visitors to make a whole day of it, by having a look around the rest of the National Maritime Museum, the Painted Hall in the Old Royal Naval College, and if time permits, the Royal Observatory. I would also include the Queen’s House, but this is currently closed for renovation until July 2016. This exhibition opened on the 20th of November 2015 and will only run until the 28th of March 2016, so if you will be in the UK during this period, you won’t regret it. 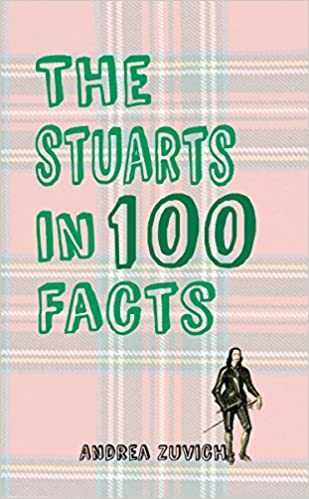 I thought it was one of the best exhibitions on Stuart Britain for some years (the last best one being Henry Stuart: The Lost Prince exhibition back in 2012). 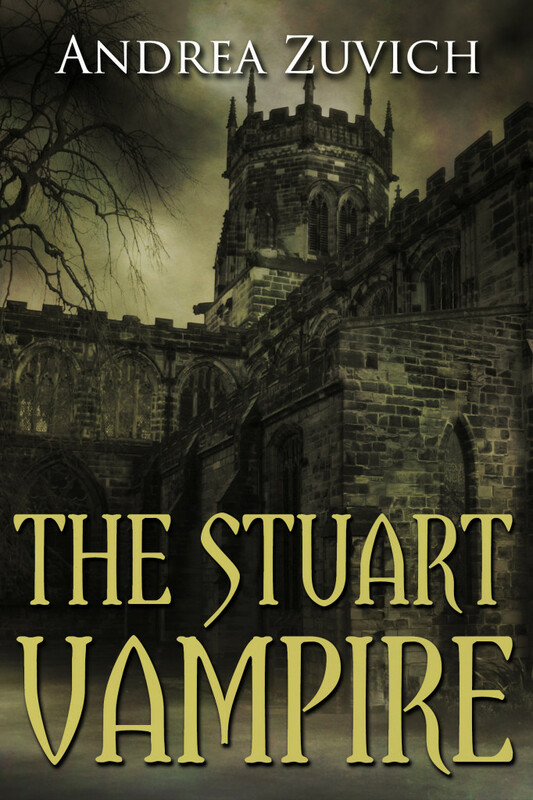 It’s brilliant that the Stuart period is undergoing a surge in interest after being so long in the shadow of the Tudors. For more information and tickets, please visit NMM’s Official Website. Thank you! 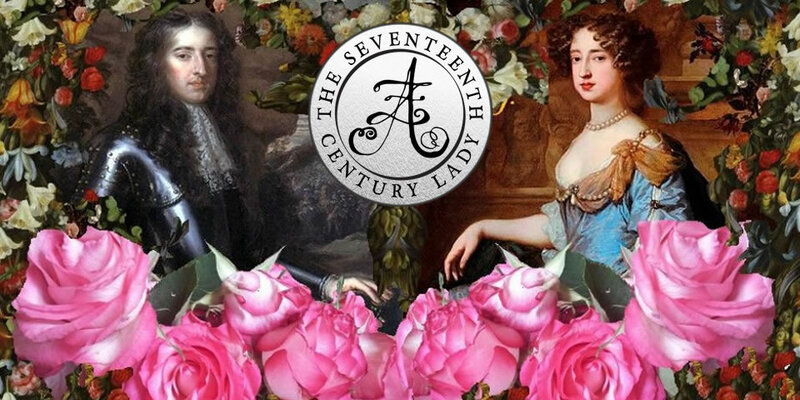 You bring the exhibit to life … since you mention him, did you see today’s blog by JD Davies taking the NMM blog to task for perpetrating the myth that Pepys was corrupt? I was cheering. And I love the pictures you found to post … James in a roman toga is hilarious. 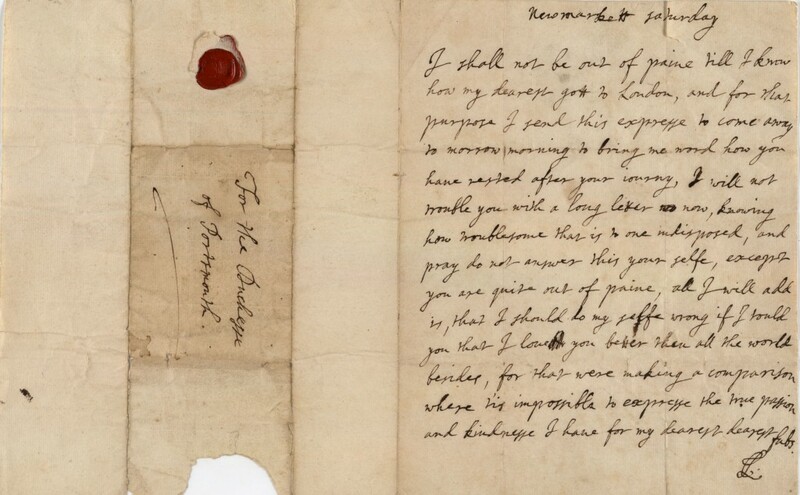 Is there any way to see a transcript of Charles’ love letter to Louise? Thank you, Sarah! 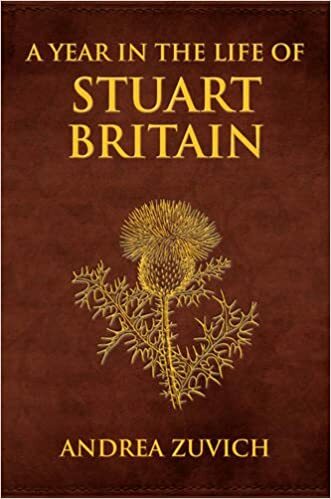 No, I haven’t read that – but I’ve only just got back onto the online world (having finished writing A Year in the Life of Stuart Britain! ), but I’ll definitely have a look. Thanks for letting me know 🙂 I love that painting of James II – it’s so colourful! As for the images, I obtained them through the National Maritime Museum. Excellent review. Would love to fly over from land of Oz but will settle with the blogs at NMM link. You know that I too love this period in history and have managed two visits to the exhibition but I’m afraid that I cannot be quite so fulsome in my praise for it,though it’s a must to visit. You are right in that the exhibits, particularly on loan, were excellent showing the artistic richness of the age. 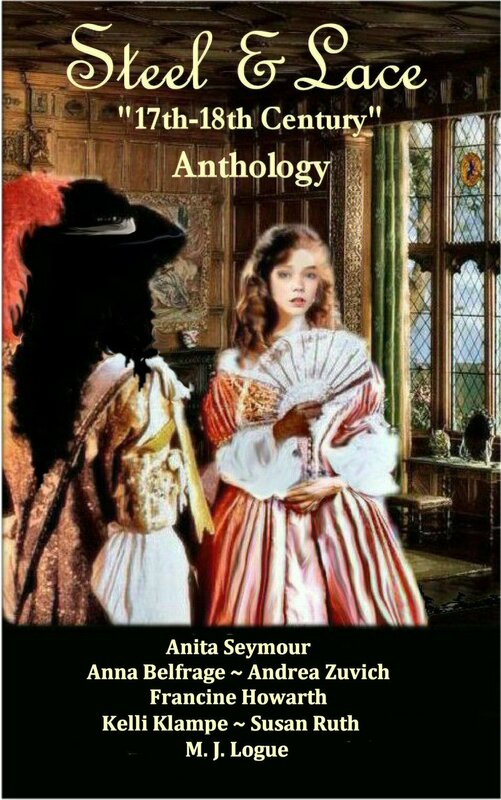 However, for me it was distinctly one sided, a saga from a royal point of view. I did not feel that I knew Pepys the man any better. No mention, for example, of his dalliances in Deptford with Mrs Bagwell or constant engagement in day to day naval business and ship construction. In fact not a single mention of Deptford in the entire exhibition! (the premier Royal Dockyard at that time) Where were the many ship’s models from the period that NMM possess ? I suppose that his diary is a tough act to follow but nonetheless, I hoped that the exhibition would illuminate the years following its conclusion. He is quoted in Richard Endsor’s book “The Restoration Warship” which certainly should have been on the NMMshop shelves alongside J.D. Davies “Pepys’s Navy” as having said that the Thirty Warship programme was the proudest achievement of his career,built in yards starting with Deptford but of course we can’t mention that as these days the “Royal” borough of Greenwich, would never admit that dirty old Deptford still exists or might possibly have a richer history than their own. Corinne McCormick, Emily Garnica, and Trinaty Barber.